5 Comments for "Orange Delight"
This is a great healthy dessert option. Tastes like an orange creamsicle -MMmmm! For those who can't drink dairy, try using vanilla-flavored soy milk. No need to add vanilla extract. Be sure to check the nutrition facts label. Choose a product that contains at least 30% DV calcium in the soy milk per 8 fluid ounces. This has been a big hit, even with those who have never tried soy milk before. Used in classroom demonstrations- enjoyed by most all students. Great recipe they were going to try it for Mother's Day treat! This recipe is better without the water; using only milk. Also if you like it thicker add some vanilla or lemon yogurt! 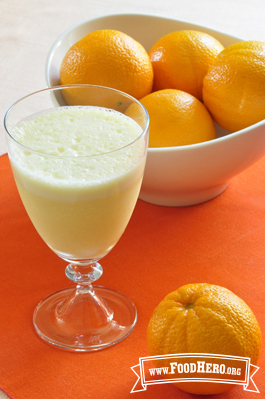 This recipe reminded me of an Orange Julius. It was really good and I even used skim milk. It makes a very foamy top and the kids had fun seeing who had the biggest milk mustache. A fun way to get more dairy into our diet.